· The best perfume ads? It all started with an Etro sample...about a year ago. I still haven't bought a bottle of perfume. Still contemplating. I had considered buying Annick Goutal's Passion, a beautiful dusky tuberose, almost a "skin scent," then I started getting into Montale. And I still haven't decided. At first I was sure one scent would jump out of the sea of samples, screaming, "Buy me in full size!" but that's a bit silly and old-fashioned. That happens only if you buy perfume from a department store. Because most of the scents there have to have an immediate effect, otherwise you wouldn't buy them. With the samples, you get something like Etro or Montale, something that takes an inordinate amount of time to either grow on you (Etro) or develop in the first place (Montale). It's rather the opposite of everything else in modern living--it's actually become a slower process. This doesn't include all the fragrances I like, by any means. It's just the narrowest interpretation of what I might begin to consider buying. I found the Etro scents overall masculine. Even Vicolo Fiori, which in my department-store days I would have considered...is almost purely floral, smells like a good quality soap from an obscure shop, yet still has a masculine edge. Hard to describe, but you know it immediately when you smell it. I found Annick Goutal overall feminine. Even Eau d'Hadrien, which is unisex, smelled distinctly feminine to me in its spare, almost mathematical construction. Néroli got bumped off the list for its lack of staying power. Diptyque...is a weird house. None of the scents lasted well on me, save Eau de Lierre. I put Do Son up for its sheer luscious authentic reconstruction of a garden, complete with sunshine and running water. Fracas is something I'm pondering as a layering scent. It's lovely as is, don't get me wrong, but I think it's more versatile than that. Montale is the obvious choice for me. Of the houses I've tried, it's easily the closest to what I'm looking for. Nope, I haven't tried the bazillion other houses out there. I suppose I could. I'm not persuaded it's necessary. I suppose it's more of a philosophy. When I find something I like, I tend to stick with it. I realize it's something of an anachronism now, since we have that many more choices, but I've always been like that. I don't feel I need to continuously "upgrade" or be off in search of the newest and latest, except as a sort of experimental phase. As much as I don't actually espouse retail therapy as a way of life, I do think women around the world should have their bit of fun, at least before settling down. :) It doesn't have to be a wallet-draining experience; it can be a creative one. Cyndi Lauper's "Girls Just Want to Have Fun"
A Streetcar Named Desire: "Aw, let the girls have their music." Shania Twain's "Man! I Feel Like a Woman!" Hm, I'm not one for samples. The whole process drives me nuts for some reason. The faceless wee things, and I've been burned by samples before. Something I really loved turns out to be real disappointing full size. As such, I tend to buy bottles, even without trying, which may not be smart, but I'd rather not go through the fuss. 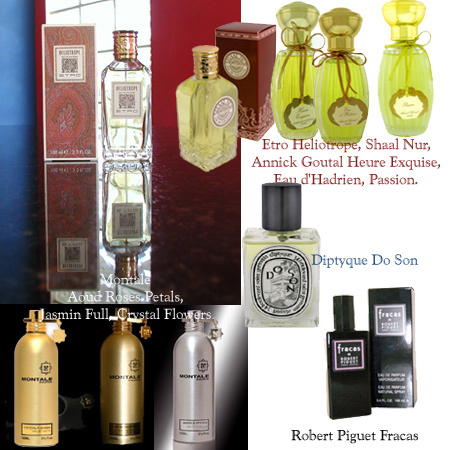 Just purchsed Parfumerie Generale Bois Blond, with a few samples. But I also have my eye on: Shiseido Bois de Feminite, Chanel No. 19 parfum, and Guerlain Apres L'Ondee. Eh...one thing I've found with samples is that you have to apply a lot of the stuff, to replicate spraying it on from a regular bottle. Those little plastic wands are next to useless. It's easy to see a point where you could spend more money on samples than you would on an actual bottle of perfume. I've been judicious about what I've decided to try as a result. Or you could simply end up in a sort of samples hell, never buying a bottle of anything in favor of buying more samples. Those Montale samples though, amazing...nothing the way they've been described on the Net. There is a distinct Middle Eastern flavor to them, it's instantly recognizable. The interpretation of roses is nothing like other rose scents, you don't get that sort of...blandness, or generic rose quality. Now I'm wondering about the reviews of other Montale scents I've read. A lot of people missed the saffron in Aoud Roses Petals altogether. It's literally like smushing up saffron threads and mixing them with water, it's very strong, almost as strong as the roses themselves (and stronger than the oud imo). From this point actually, I feel inclined to try only Montale.